I have a confession: I don’t use frequent flyer miles, or points, or rewards, or whatever they’re called. When people talk about getting free flights or using certain credit cards to earn miles, I just smile and nod because I have no idea how any of that stuff works. I fly, but I just pay for my ticket with whatever card has more room on it, or I use my debit card if I’ve got cash available at the moment. I don’t even bother to sign up for whatever frequent flyer program is offered on the particular airline I’m flying, since I don’t travel a ton and I always fly whichever airline is cheaper on Orbitz or Expedia’s fare finder. Now that I’m writing for a website that specializes in credit cards and credit card rewards, however, I figure it’s high time that I learned exactly how these programs work, and what I might be missing. The trees are in bloom outside my office window, a spring breeze is blowing, and I’m plotting to fly away for a summer vacation. This time, though, I’m going to map out the frequent-flyer maze first, so I can make every mile count. When we talk about frequent flyer programs and credit cards, it’s helpful to think about three different types of rewards programs, or types of rewards. The subject of airline rewards is fairly complex and can be quite confusing – that’s why there are entire websites and blogs devoted to frequent flyer points and programs, and how to navigate them to your advantage. That’s also why I’ve steered clear of them for so long. But it really doesn’t have to be that complicated. Cards that let you earn “real miles” – that is, when you earn a mile, it’s actually worth a mile in whichever frequent flyer program you use. Cards that reward you with “miles” that are more like points – you redeem them for a cash bonus which you can then use to purchase tickets. American Express Membership Rewards – this unique program really offers the best of both worlds. You earn points, but can choose whether to exchange them for a cash bonus (or other rewards, like gift cards) as in a traditional cash back program,or you can transfer the points to the frequent flyer program of your choice, where each point will count as a “real mile” in that program. AmericanExpress is in a class by itself with this program; there’s nothing like it offered anywhere else. It’s a “real miles” program and a points-based cash back program in one. Before I write about our first category of frequent-flyer cards, let me clarify one thing – frequent flyer programs exist outside of credit card rewards programs. Sure, using credit cards can help you maximize your frequent-flyer program rewards, but you can join a frequent flyer program without a credit card. Even if you pay cash for all your plane tickets, you can become a member of any frequent flyer program– Delta SkyMiles, United Mileage Plus, and American Airlines AAdvantage are just a few examples. Every airline offers its passengers a frequent flyer program, and it’s free to sign up. All of these programs operate by letting you use miles to buy tickets. You earn these miles by flying on their airlines – the more miles you fly with them, the more miles you earn. When you want to redeem those miles for a free flight, that flight will cost a set amount of miles. For example, with American Airlines AAdvantage program you can buy a round-trip economy-class ticket anywhere in North America for 30,000 miles. A flight from Indianapolis to Denver (ballpark cost, $300) or a flight from New York to Vancouver (average price $500) will both always cost the same amount of frequent flyer miles. 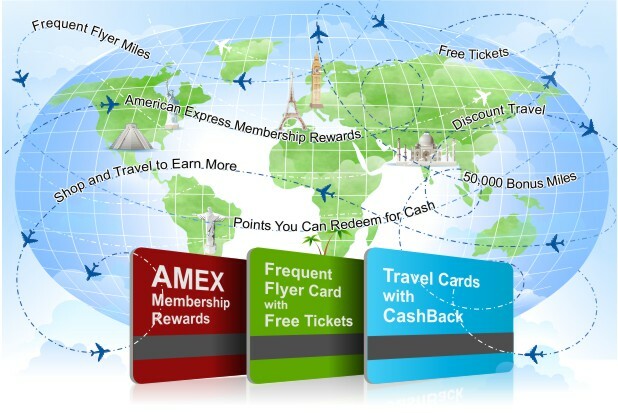 If you want to learn more how to choose the best frequent flyer program and the right credit card to earn enough rewards for a free flight, you can use RewardExpert.com - free online service which will help you craft a strategy using points and miles to get you where you want. When you have a credit card that lets you earn miles – real miles – and transfer them to your frequent flyer program, you can add to your frequent-flyer miles club balance by doing things besides flying. How else can you earn miles? Take a look at the Citi® / AAdvantage® Platinum Select® World Elite™ Mastercard®. Just for signing up and spending $3,000 in purchases within the first 3 months of account opening, on anything you like, you’ll earn 60,000 bonus miles to use on an AAdvantage Award flight from American Airlines. You'll get double miles for eligible American Airlines purchases, so if you spend $5,000 on American Airlines flights, you'll get 10,000 miles. Purchases at gas stations and restaurants also earn double miles and if you spend $5,000 throughout the year, you’ll add 10,000 miles. The great thing about using your miles to get tickets – besides getting free tickets! – is this: plane ticket prices vary like crazy. Next time you fly somewhere, after you squeeze your bag into the overhead compartment and fold yourself into your seat, look around at your fellow passengers. Do you think most of them paid the same amount for their plane tickets as you did? The answer is almost always no. Your seatmate might have paid a hundred dollars less than you did, or two hundred more. Maybe he bought his ticket on Friday when you bought yours on Tuesday, or maybe she bought hers three months ago and you bought yours last week – the reasons that airfares differ so much from one customer to another are many and varied (not to mention random and unfathomable). When you buy your ticket with miles, however, it will always cost the same amount. A round-trip economy class ticket from New York’s JFK airport to LAX (Los Angeles) always costs 25,000 miles through American Airlines’ Economy MileSAAver program, or 50,000 miles with their Economy AAnytime fare. If you want to fly business class, it’ll cost 50,000 miles for the MileSAAver fare or 100,000 for an AAnytime fare. First-class tickets go for 100,000 miles or 170,000 miles. Let’s go back to those 80,000 miles you could earn using the Citi® / AAdvantage® Platinum Select® World Elite™ Mastercard® over the course of a year. How much potential value are we talking about? Say you want to fly from JFK to Honolulu, Hawaii, economy class. This will cost you 40,000 frequent flyer miles if you go off-peak with a MileSAAver fare, and carries a value of approximately $800-$1000 – since flight prices vary, as we’ve established. Plus, you’ve still got 40,000 miles left – which may be enough for another domestic economy flight. Now, the caveat: when you redeem your miles for tickets, you need to book in advance, and you need to be flexible. Blackout dates can apply, depending on the airline, and there are always a certain number of seats reserved for passengers traveling using rewards miles. That means these tickets are best when you’re planning a vacation with flexible dates, at least a month or two in advance. >> oneworld (13 airlines, including American Airlines, British Airways, and Qantas). This gives you a pretty wide range of options when you’re booking a flight – when you’re free to check all the partnering airlines, one of them is sure to fly where you’d like to go. Last but not least is the Membership Rewards program from American Express, a unique program raved about by the editorial team at Credit-Land.com; one that gives its members flexibility and value that no other card currently offers. It works like this: when you are an American Express card member and you carry a card that participates in their Membership Rewards program, you’ll earn points on all your purchases. How many points you earn will depend on which card you have – they all give at least one point per dollar, but some give two or three per dollar in certain categories, like gas, groceries, restaurants, etc. These points can be used in the usual way that cash back programs work – exchanged for cash or gift cards, or used to shop in the American Express Membership Rewards mall (ShopAmex). This is one way to get value back for your money. However, the thing you can also do with your points - what American Express allows you to do, that no one else does – is apply those points to the frequent flyer program of your choice. This is where you can really see big rewards and get the most value for your money. You’ll simply go to the American Express website, choose the airline you’d like to transfer your points to, and watch your miles balance soar skyward. Each point will be worth one mile. You can transfer your points to JetBlue or Southwest if you’d like to take one of their bargain flights, or you can transfer them to United and have access to the entire Star Alliance – the points transfer anywhere. American Express has the ability to do this because of their unique relationship with airlines, probably owing to the fact that they established a travel division back in 1915 and have been known for their specialized travel services ever since. So, how much can you save using the American Express Membership Rewards program to add miles to your frequent flyer program? It depends which card you have, but for high-spending card holders, especially small or medium sized businesses, it’s easy to accumulate a lot of points. When a business puts all their expenses on an American Express charge card, it’s likely that they can easily earn 125,000 points in a year, which equals 125,000 miles, which is good for two business class flights per year, anywhere in North America. A typical business class seat on a flight from JFK to LAX costs about $3,000, and some business class tickets can be as high as $5,000. If you get two free business class flights in a year, at a value of $8,000, and your business spent $125,000, that’s a return of 6.4 percent. No cash back bonus program can beat that. Now for the downsides to the American Express program – though they aren’t many. These cards don’t tend to have sign-on bonuses, or if they do, they are small. They usually have annual fees that can be as high as $450, though they usually hover around $150. The terms can be confusing, and you have to put some time and effort into figuring out how to use the program. Redemption of benefits is not automatic – you have to do it yourself. This isn’t for the person who doesn’t want to invest a little bit of energy into making a rewards program pay. In spite of these potential drawbacks, if you do spend the time and you are strategic about using your card and redeeming your rewards, you’ll get a lot of bang for your buck. There really is no better program for the frequent flyer – especially a business owner and frequent traveler. Oh, and one more thing – the points you earn with American Express Membership Rewards will never expire, and there is no cap on how many you can earn. If you own a high-spending business and save up your points over the years, you can probably earn enough to fly around the world, first class, when you retire! Okay, so none of these frequent flyer programs offer flights to the moon – yet. But I hope you see now that there are myriad options for getting free flights to pretty much anywhere you’d like to go. The key is to know which card is going to be right for you – your spending habits, your travel plans, your life. Having a few different cards will give you the best rewards options whether you’re booking flights in advance, with flexible dates, or traveling within tight parameters. I know that after analyzing all my options and all the amazing rewards programs available, I’ll never again sit back and pay full price for an airline ticket without being a member of a frequent flyer program and being strategic about which card I put my purchase on. 7 The card´s rates, fees and other terms are subject to change. Therefore, we do not guarantee that information presented on this page is current and up to date. Please, visit the bank´s or credit card company´s website to review the current Terms & Conditions.